Today on the blog I have a lovely new picture book for young children to share with you. 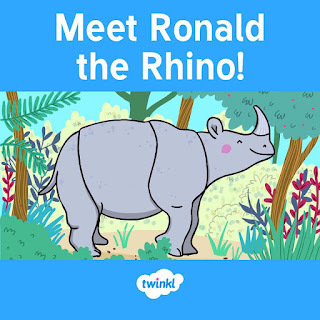 Twinkl Resources have recently released a new eBook which is available for subscribers to download and share with their children. Physical copies of the book will also be sent out to Twinkl Book Club members, an extra service which can be added to your subscription. 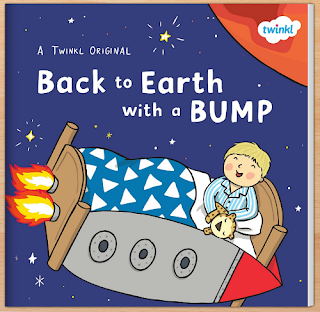 Back to Earth with a Bump is a lovely story about a little boy called Hal who is sent on a night time mission to find out where the sun has got to as he explores space from his rocket bed. The story is told in simple rhyme and illustrated in the familiar Twinkl style with plenty of simple and colourful pictures. On his journey, Hal learns about the moon, the stars, Mars, and finally discovers the reason that he can't see the sun at night. It's a very sweet little story and introduces some basic facts to little ones which can then be expanded upon depending on the age and interest of the child. Twinkl have also produced a range of lovely resources to support reading of the book. 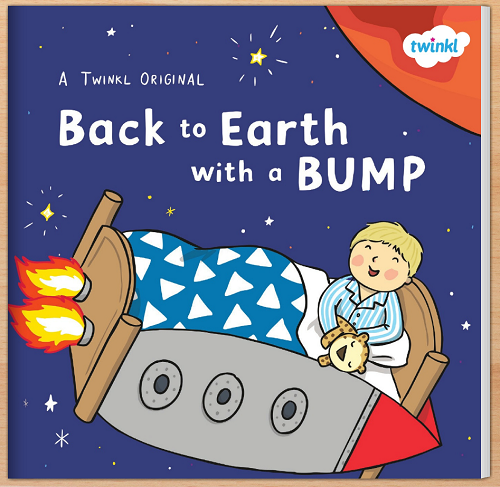 Some are very simple for the youngest readers, like this Back to Earth with a Bump Size Ordering printable and some Pencil Control Activity Sheets. Others are brilliant for older children, like the Maths Multiplication Mosaic Activity Sheets and Back to Earth with a Bump Crossword. There are also plenty of display materials and lesson plans based around the book. It's a really lovely story, great to share with young children and spark their interest in the things that they see in the sky at night. I have been provided with a Twinkl Platinum subscription in exchange for sharing information about the resources across social media. Today I'm sharing a selection of new picture and board books from Gecko Press which would make some great stocking fillers for toddlers this Christmas! Wolfy by French illustrator and writer Gregoire Solotareff is a brightly coloured story about a wolf and a rabbit. The wolf has never meet a rabbit before, and the rabbit has never met a wolf before, so when they bump into each other, even though they both know that wolves are supposed to eat rabbits, they become good friends and learn and play together. But one day while they are playing, Tom the rabbit becomes scares of Wolfy the wolf and won't come out of his burrow. Wolfy is sad, and leaves in the hope of finding another rabbit friend. But while he is away some other wolves mistake him for a rabbit, and he suddenly understands why Tom was so scared of him. He returns to apologise sincerely to Tom, and they are friends again. It's a lovely story with important messages about not judging people by a label and understanding the feelings of others. The Longest Breakfast follows a hassled Dad who is trying to keep up with the multitude of breakfast requests from children and friends who all want very different things and a baby that knows exactly what he wants but no-one realises until the end. It's a funny story that replicates the breakfast chaos in many families, and opens up lots of opportunities for chat with your toddler about your own breakfast likes and dislikes. Good Night Sleep Tight is a collection of eleven and a half stories for bedtime featuring Fox and Rabbit. Some of the stories are very short, just a page, and others are a little longer, so you can tailor your reading to the mood and tiredness level of your child! The stories feature charming illustrations that bring the stories to life. Bim Bam Boom is a simple board book for toddlers that captures the joy of making music with pots and pans along with a collection of sweet little cheeky animal characters. There are lots of opportunities for expressive reading aloud and the simple repetition that toddlers love, and an ending to make them giggle! I was provided with copies of these book in exchange for this review. Amazon links are affiliate. The Magical Ice Palace: A Doodle Girl Adventure by Suzanne Smith and Lindsay Taylor, illustrated by Marnie Maurri, is the latest outing for Doodle Girl and her friends. Doodle Girl has a magic sketchbook and a magic pencil, and whenever she whispers the words "Draw, draw, draw..." amazing adventures begin to unfold - all it takes is a doodle! Beginning with a curly, curvy shape, Doodle Girl and her friends begin a sparkly, icy adventure. When they find a sad, lonely mammoth high up on a mountain, she needs to use her magic pencil to rescue him and help him to celebrate his birthday in the palace. It's a fun story that shows just how limitless imagination can be, and the book also includes a giant colour-in poster for more creative fun. I received a copy of this book to review. Amazon link is affiliate. Words and Your Heart by Kate Jane Neal is a lovely new picture book about the power of words, and how we use them. It talks about how important your words are, for example if someone feels sad you can cheer them up, if someone wants to give up then your words can help them keep going. Your words can change the way someone's heart feels. But of course sometimes words can make other people feel sad, and so it's really important to make sure that you use your words to look after each other's hearts. This book demonstrates beautifully how we need to think carefully about what we say, both positive and negative, in a way that isn't preachy. I can see how it would resonate really well with young children, and would be particularly good for older children that are experiencing difficulties in their friendships. It's a lovely book with a universal message. I was sent a copy of this book to review. Amazon links are affiliate. We very much enjoy the Supertato books, and so I was delighted to be sent a new one for our collection to review. Supertato: Evil Pea Rules by Sue Hendra and Paul Linnet is all about Supertato's nemesis - The Evil Pea. The Evil Pea has a plan, an evil plan. He's fed up with staying in his boring freezer, and by tricking Supertato he's able to freeze the entire supermarket. But unfortunately his evil plan backfires, and instead the veggies have a fantastic wintery time! With a Christmas theme, this book is a great one to add if you are planning a book Advent Calendar, or to pop under the Christmas tree to enjoy in the run up to Christmas. If you are looking for a lovely picture book to share with young children this Christmas then I have a gorgeous book to share with you today. Angel's Great Escape: A Christmas Story written by Kirstie Rowson and illustrated by Kristyna Litten is a new book about Angel and her Christmas friends. It's Christmas Eve, and Angel is looking forward to a magical Christmas with her decoration friends. The only problem is that they are trapped in a box at the home of the Mean family, and they are desperate to escape to a nicer home and perhaps even meet Father Christmas on the way! I love books about Christmas, and sharing a festive book is a really fun way to enjoy this magical time of year with little ones. This book is very sweet, with a lovely flowing rhyming story and beautiful illustrations that bring the story to life. Definitely one to add to your Christmas book collection! According to the Office for National Statistics, today, the most popular birthday in the UK for the last 20 years falls today on the 26th September. In addition, eight of the top ten birth dates are towards the end of September. To celebrate, Netflix have released their brand-new Birthdays On-Demand feature. Netflix has revealed that 64% of children's parties are themed after their favourite TV shows or movies, and 70% of parents find organising a birthday party for their child stressful. With this feature, parents can add a little bit of extra magic to the festivities. 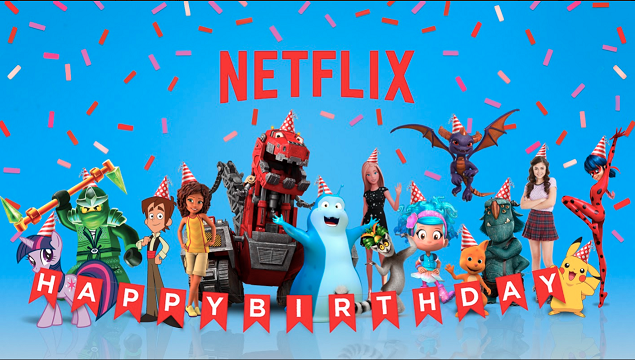 Netflix has released 15 Birthdays On Demand, with characters including Pokemon, My Little Pony and Barbie. All you need to do is search 'birthday' on Netflix and you can unlock a special performance. Your child's favourite characters will sing them a special birthday greeting, and it's a great way to make their birthday special. Birthday messages from the following shows are available, and you'll definitely find one that suits your child, however old they are going to be! Survey methodology - The survey was conducted by SurveyMonkey from June 26th-July 10th, 2017 and based on 14,582 responses. The sample was representative of an adult online population who have a child 8 years or younger in the household in The United States, UK, Philippines, Singapore, India, South Korea, Mexico, Brazil, Argentina, Colombia, Chile, Peru, Turkey, France, Germany, and Italy. The sample was not weighted or balanced. Within individual countries, the margin of error is +/-3% at the 95% confidence interval in all countries except Singapore (+/-5%), South Korea (+/-4%), and Argentina (+/-4%).